President Barack Obama spoke of seeing "glimmers of hope" in the economic outlook for the first time since the current downturn began, while Federal Reserve chairman Ben Bernanke said he was witnessing "tentative signs that the sharp decline in economic activity may be slowing". But the pair's comments, coming on the same day as worse-than-expected retail sales and inflation figures, did little to revive investors. 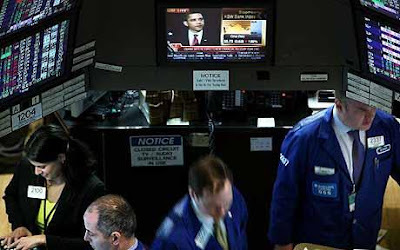 The Dow Jones Industrial Average index traded down 137.63 points at 7920.18 on Wall Street. The speeches came days after Larry Summers, the President's most senior economic adviser, suggested that America's economic "free-fall" is coming to an end. Although the Fed remains independent of the Obama administration, the three speeches, coming in such quick succession, appear to be part of an orchestrated campaign by the White House to forge a positive attitude among the population. Coming in a month when tens of millions of Americans will begin to receive several thousand dollars in tax rebate cheques, it appears that the White House is trying to kick-start the economy by encouraging consumers to return to spending, rather than continuing to hoard savings. The need for such a strategy was highlighted in March's retail sales figures, which showed a 1.1pc decrease in total sales, a surprise to economists who had been forecasting a 0.3pc increase. Goldman Sachs' chief US economist Jan Hatzius said the report puts "consumption on a weak path into the second quarter", noting that electronics sales were down by 5.9pc. Retail sales are key as consumers account for two-thirds of the US economy. Headline producer prices also fell, by 1.2pc month-on-month. The decline was concentrated in energy and food prices, due to weakening demand and, for energy, pipeline pressures. But the negative economic data did not stop Mr Obama from appearing positive during a speech on the efforts taken to revive the American economy. "There is no doubt that times are still tough" he said. "By no means are we out of the woods just yet. . . But from where we stand, for the very first time, we are beginning to see glimmers of hope." Mr Bernanke based his assessment of the economy on recent positive data from the housing and other markets, but stressed that this is still the worst financial crisis since the Great Depression. "A levelling out of economic activity is the first step toward recovery," Mr Bernanke said, adding that he is "fundamentally optimistic" about the US economy, the foundations of which he believes remain "strong". But not everyone agrees. With reference to Mr Bernanke's comments last month about the "green shoots" of recovery, Ethan Harris, Barclays Capital's co-head of US economic research, said: "The green shoots are looking a little brown."